Thank you to Tomas and wonderful Jolanta for the flawlessly performed procedures and excellent dental care training. A professional and wonderful doctor with unreal memory! Good work, thanks Tom. I have been attending your clinic for more than 12 years and I always go out with a smile. Good luck and follow on! Thanks to all the clinic doctors for professional services and pleasant communication! I want to thank doctor Darius for a painless and quick farewell with the 8-tooth. THANK YOU! For sure I will recommend you to my friends! I am glad about your honest work and modern technologies. Your attention to a person is a significant contribution to your patients' mood. Success at work! Thank you. Despite my respectable age, in one single visit my decayed teeth were removed, four implants threaded and fitted prosthesis at the same day. I was not without teeth any single day, and now I am glad with my new zirconium ceramic teeth. I am fascinated by the work of the clinic's staff, respect for the patient, warm working relationships. I wish you continued success in every business hours and days-off. I have been the patient of doctor Tomas since 2007, each visit to his clinic leaves a wonderful, lasting impression. I am very pleased with his work. Six years ago inserted implant serves without mistakes; I even forget that it is not my teeth. Thank you very much to the entire clinic's staff, you are true professionals. It was a pleasure to visit you. Thanks again to Tomas, Darius and most pleasant Jolanta. Until the next meeting! Thank you to doctor Jolanta Ruzgienė who cured my paradontosis and doctor Tomas Stumbrys for a new bridge on my hopeless teeth, I feel again like in my youth! You do a great job. For several years, I suffered from the inconvenient removable dentures that did not comply with the mouth. Several medical institutions told me it was because of the poor condition of the bone and that they would not be able to make implants. However, doctor Tomas Stumbrys brought back the joy of life, he inserted implants on the same day and attached the old dental plate, I can chew again, and after three months I had beautiful new teeth. I want to smile again! I trusted doctor Tomas Stumbrys to take professional dental care of my teeth and treatment. I have been his patient for about ten years. I am very satisfied with the genuine, high-quality work and I am happy with healthy and beautiful teeth. A visit to the dental clinic does not cause stress, special attention is paid to every patient. Here you will find a professional team of doctors, you will receive a pleasant service and there is a warm, cosy atmosphere. I found what I sought. I am very grateful to doctor Tomas for my creative dental repairs carried out a few years ago. He arranged what was done poorly since 1961. The results of the performed work are stable and of good quality. I offer to provide vocation to knighthood for doctor Tomas Stumbrys. Tom! Thanks to you and your team for a well-done a job. Amazing!! I can smile again. In just one day, my teeth were replaced with implants and prostheses were made. Thanks again for the inspired self-confidence! Thank you very much for the new, white and very beautiful teeth! Thank you for your professionalism and a well-done job. I also thank the assistants. I would like to return here!! For many years I walked with partial removable dentures, teeth were moving gradually until they began to fall out in the end, and there remained only a few ones. I am extremely grateful to doctor Tomas Stumbrys for my dream smile and revived confidence. The teeth were removed, implants were threaded and teeth were put in unexpectedly quickly. I am very happy with the results. Thank you for your promptness, thank you for giving me the chance to smile again! Thanks to all the doctors and clinic's staff for the excellent service with high performance of culture and the returned smile. It was worth traveling all those kilometres so that I could smile and regain my self-esteem! I am glad to modern technology, and I am very grateful to doctors Tomas Stumbrys, Jurate Ilonienė and clinics throughout the staff! Services performed flawlessly, and work with excellent results! What happened? You are so rejuvenated! Such comments I got after your visit to the clinic. These are the miracles performed by PAPADENT doctor Tom and his team. Thank you! I am proud and glad esteemed physician T. Stumbrys works. Thanks to him I can smile a mouthful of teeth and, of course, plenty to eat at the crocodile as interrupts and well sukramtydamas and pasigardžiuodamas. But most importantly - can divide a smile to people not only through St. Christmas Day, but every day, which is now for me is just like strangers !! I am very, very grateful to the whole team! 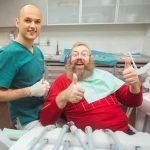 Just visit the clinic "Papadent and after hearing the doctor - dentist Tomas Stumbrys realized that at last there is hope to have a beautiful smile that will change my life, not only for aesthetic purposes. Just a smile exchanged 24valandas cardinal. And what to speak of normal eating characteristics. Why Papadent? Everywhere and everything is determined by humanity and attitude towards us. The clinic staff is not only very nice, caring, flexible, but also a professional not only work, but also the sense of humanity. I sincerely thank you and a smile "Papadent. Thank you for your sincere work! Dental clinic PAPADENT consults and treats themselves most professional experts.